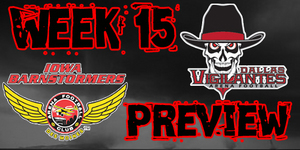 The Barnstormers could not break their losing streak last week as they fell to the Dallas Vigilantes 57-71. They came out to a good start and lead 17-14 at the end of the first quarter, but the game gradually began to slip away from the Stormers’ grasp in the second half. The Vigilantes were able to take advantage of three Iowa turnovers, converting them into touchdowns. Iowa was outscored 30-20 in the second half which was just enough for the Vigilantes to secure the victory. The loss keeps the Barnstormers in fourth place in the National Conference, Central Division while the Vigilantes remain in first. The Iowa Barnstormers (2-6) will take on the Jacksonville Sharks (7-1) this Friday at the Veterans Memorial Arena in Jacksonville, Florida. The Barnstormers will be looking to upset the Sharks and break their own 5-game losing streak in the Sunshine State. In what will most certainly be an epic battle, the Barnstormers will need to bring the brawn to the field as they take on this very well-rounded and developed team of the American Conference. The Jacksonville Sharks have had a near perfect season this year with a record of 7-1, winning their last seven games in a row. Last week they took on the Philadelphia Soul in Philly. The Sharks held the lead for the entire game and even prevented the Soul from scoring at all in the third quarter. The Sharks pocketed the game with a final score of 58-42. The 16-point victory earned three Sharks the recognition of National Guard MVP, Russell Offensive Player of the Game and Riddell Defensive Player of the Game. The win also secured Jacksonville’s first place rank in the American Conference, South Division. Iowa Barnstormers @ Jacksonville Sharks will be broadcast LIVE on 1700 AM The Champ, on the Internet at www.theiowabarnstormers.com and at www.nifty-tv.com. -This will be the first meeting between the Iowa Barnstormers and the Jacksonville Sharks in their franchises’ history. Sam Smith was a strong component of the Barnstormer Defense last Saturday against the Dallas Vigilantes. He tied Iowa’s game high tackles with 5, 3 solo and 4 assists. Sam has played all 8 games for the Barnstormers this season and ranks in the top 5 among the defensive players. He has tallied a total of 33 tackles (25 solo and 16 assisted), 1 interception, 1 forced fumble and 2 breakups for the 2011 season.